Plate 4 x 105 cells in a 6 well plate. 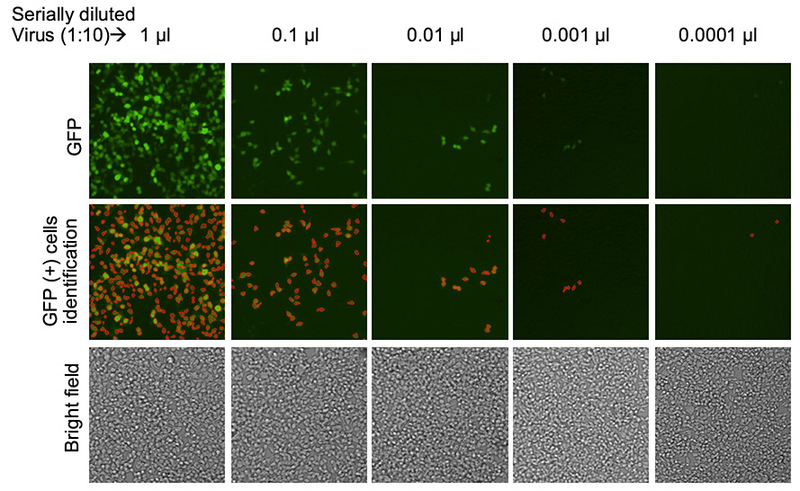 Images show captured bright field images for each dilution (bottom row), GFP positive cells for each dilution (top row) and Celigo software identified and counted (cells outlined in red) GFP positive cells (middle row). This data shows that Celigo has a wide range for cell counting. It counted as few as 18 GFP positive cells per well to over 28,000 GFP positive cells per well. 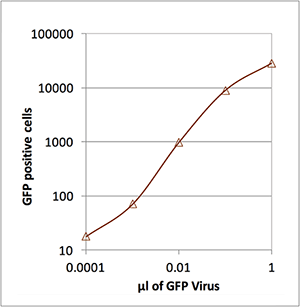 The number of lentivirus-transduced cells was shown to be directly proportional to the amount of virus added to each well. By counterstaining the cells with Hoechst, the Celigo software identifies and counts each Hoechst positive and GFP positive cell. Because Celigo counts every labeled cell in the well it can automatically report the number of cells in each well as well as the percent transduction.